ELVA-1 Company reports successful installation of PPC-10G-E 10 GE radio by Redlan Telecom Sl, ELVA’s customer in Spain. The customer chose this radio, because they need to cover a long hop of up to 10 km, and only ELVA link provides 10 Gbps communication at such long distance. 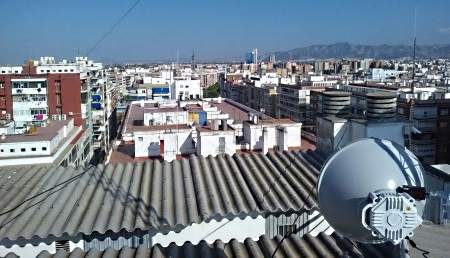 After installation, PPC-10G link has demonstrated 10 Gbps full-duplex throughput and stable connection over Murcia urban area. Both radios of the link are equipped with 60 cm antenna, mounted in rooftop locations and provided very reliable operation at 10 Gbps speed. Consider Redlan Telecom Sl datacenter services, it is important to this company to has ultra-high throughput connectivity to customers locations. PPC-10G is IP radio link, providing up to 10 Gbps full-duplex throughput. The link is intended for point-to-point applications such as 5G/LTE+ Backhaul, Corporate Campus Networks, IPTV, and other Wireless ISP backbones. All ELVA-1 links contains slots for SFP/SFP+ modules and are designed for interconnection between remote WAN/LAN segments that located on the sites with no fixed line broadband connection. Typically, this is for landscape or industrial barriers or ecology restrictions for ground cable laying like national park, river, lake, airport/railway area, private land, etc. Spain, as other EU countries has chosen to open the 71-76 and 81-86 GHz ITU “E-band” frequencies for ultra high capacity point-to-point communications under light licensing rules. Please send all inquiries on PPC-10G-E radios via email to ELVA-1: sales(at)elva-1.com. Redlan Telecom Sl is local telecom operator at Murcia, the capital and most populous city of the Autonomous Community of the Region of Murcia, the seventh largest city in Spain. The company integrates new technologies in such areas as telecom, datacenter, security systems and offers excellent customer service, including active after sales support for customers.